Six University of Notre Dame students received special honors for their undergraduate research work during the ninth annual Undergraduate Scholars Conference on Friday (April 29). The students received the Undergraduate Library Research Award (ULRA), which recognizes individuals who demonstrate exemplary research skills through their broad use of library resources, collections, services and expertise for their scholarly and creative works. During the ULRA reception, the winners were announced and their research processes and projects were highlighted. Sponsored by the Hesburgh Libraries and the Center for Undergraduate Scholarly Engagement (CUSE), the ULRA competition honors those who conduct original research and draws focus to the extensive sources and methods of scholarly inquiry that modern-day research libraries offer today’s students. The partnership between Hesburgh Libraries, CUSE and other campus entities provides students with a network of support and offers inspiration to those beginning original research or capstone projects. 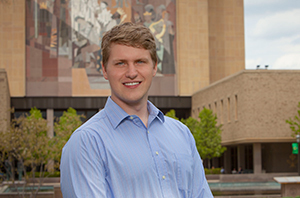 Lis won first prize in the senior/honors thesis category for demonstrating superlative research skills for his thesis, “The Myth of Locarno: Versailles, Poland, and the Continuity of French Foreign Policy, 1919-1936.” John Deak, assistant professor of history, served as his adviser. A history and economics double major with a minor in European studies, Lis explored the diplomatic cooperation between Western and Eastern Europe within the Franco-Polish alliance of 1921. Honorable mention in the senior/honors thesis category was awarded to McGee, who conducted extensive research for her work, “Faltering ‘Frames of Exception’: Feminist Contestations of Gendered Nationalism via Family Law and Artistic Productions in the Occupied West Bank.” Kelly, an Arabic and political science major, was advised by Atalia Omer, assistant professor of religion, conflict and peace studies with the Kroc Institute for Peace Studies. McGee analyzed various scholarly conversations to develop a complex explanatory analysis of activism of women in the West Bank. Her research delved deep into Palestinian history and also explored the relationship between gender and family law and Palestinian art. 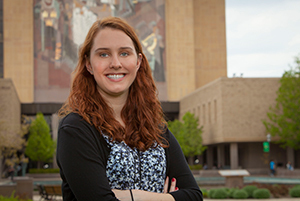 McGee initiated her research project nearly three years ago with books in the Hesburgh Library. 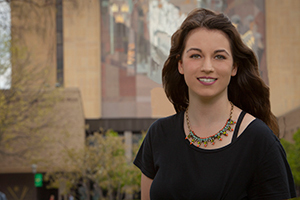 When her research took her to the Middle East, she also resourced the Library’s online books and journals and communicated through the “chat with a librarian” service. Cole, honorable mention recipient in the 20000-40000 category, is a senior history major. 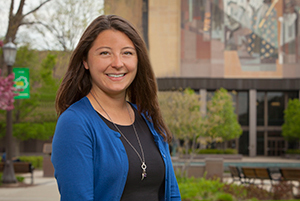 Her independent research paper, “The Lenore Mooney Papers and The Great War: Conceptualizing the World of an Individual,” was advised by John Deak, assistant professor of history. Cole is the first scholar to explore The Lenore Mooney Papers, a collection of letters written by an American woman living in Paris and serving as a godmother to soldiers during World War I. Her goal was to examine the social, cultural and political themes of World War I through personal narratives that could define how human beings regard themselves in relation to the world around them. Bonacci, a First Year of Studies student, took first place in the 10000 category. He grappled with the topic of a possible solution both to climate change and energy demands, namely thorium-based nuclear energy. Bonacci’s paper is titled, “Generation IV Reactors: A New Hope.” He was advised by Michael Westrate, program director in The Graduate School and concurrent assistant professor in history and in the University Writing Program. Bonacci explored the challenges facing modern civilization in balancing increasing energy needs with sustainability, environmental concerns and climate change. His research synthesizes vast resources that offer new hope for politically and economically viable solutions. He credits the library instructor of his Writing and Rhetoric Multimedia class and Visual Resources Curator, Denise Massa, with introducing the Libraries’ web page library.nd.edu, the Pot O’ Gold Information Literacy Tutorial, and the Remix Digital Resource Portal. He learned about concept mapping that helped him become more proficient with search strings. He mined bibliographies and notes and learned that searching is a process of strategic exploration. 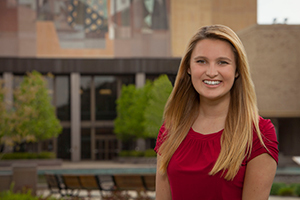 McKenna, a Glynn Scholar who majors in neuroscience and behavior and minors in science, technology and values, wrote her Honors Foundations of Theology term paper to examine homosexuality prohibitions in Old Testament law. Her adviser was Gary Knoppers, the John A. O’Brien Professor of Theology. Her research required careful attention to and analysis of a wide range of both print and electronic primary and secondary sources. While some sources proved obscure and difficult to access, she was able to find them in the Reference Collection within the Hesburgh Library. “By the end of my project, I had directly referenced 20 sources and spent time consulting at least 10 more. 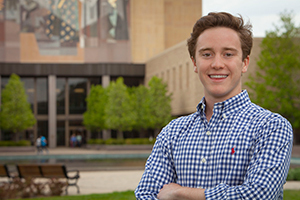 My research investigation and subsequent analysis forced me to think far outside of my comfort zone,” said McKenna. For more information on the Undergraduate Library Research Award and the 2016 winners, visit library.nd.edu/ulra. Originally published by Tara O’Leary at news.nd.edu on May 04, 2016.